The use of saline waters for irrigation is a subject of much controversy. Most farmers aren’t interested in using saline waters, they want more fresh water. But we must be looking to the future. We have to find out what’s technically feasible so we’re not like an ostrich with his head in the sand when severe problems do arrive. We know we can grow crops with saline water. But it is a tough sale. The key to growing crops with brackish water is to minimize the disincentives to using it. With that in mind, researches are being conducted in the USA that may have worldwide implications someday. They utilize a combination of fresh canal water and drainage waters from irrigated land and brackish groundwaters. Sugar beets are very tolerant of salt, except during germination. So why not use fresh water for preplant irrigations and first irrigations until seedlings are stablished? Then substitute brackish water until harvest. 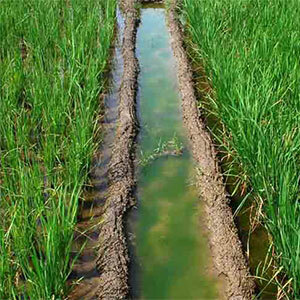 Subsequently, they can grow salt sensitive crops in the rotation with fresh water to prevent soil salination. Because of the disposal problems for drainage waters, this is a logical way to minimize disposal and environmental pollution problems and at the same time conserve water and get crop production. The equation is simple: the rotation of low salinity waters plus some brackish waters equals yields without yield reduction. This research involves a three-crop rotation of a tolerant crop like sugar beets, followed by a salt sensitive crop like lettuce or cantaloupe, which gets only fresh water throughout the growing season to leach the salinity that has accumulated from sugar beets out of the shalow depths. Subsequent irrigations leach the salts deeper, ahead of the advancing root system. So the soil is reclaimed before growing the third crop, something like wheat. The wheat crop gets fresh water for preirrigation and emergence. Then it gets brackish water. Over a two-year period, they can substitute 50 percent or more of good water with waste water. Wheat was the first crop grown in the experiment. Wheat received good water only in one experiment. On another, there was one irrigation of good water and the remaining irrigations were with brackish water. With six replications, the areas with 75% brackish water yielded 3.72 tons of grain per acre. The wheat irrigated with good water only yielded 3.66 tons of grain per acre. Sugar beets were planted in the next experiment. One part of the field was irrigated with fresh water, the other with some fresh water, followed by drainage waters. Irrespective of treatment, the yields were equal: about 32 tons per acre. Cantaloupe, the next crop planted, was harvested for seed production. Using mostly good water andsome brackish waters, yields were 102%. On the treatments where good quality water was used for germination, followed by brackish waters for the remainder of the irrigations, the yields were 94%.